A collaborative blog by: Maureen, with special thanks to Chris, Rebecca, Laura, and Wally. Sharing a passion for the outdoors and spending time with family and friends on a bike ride was how they had planned their day when the unthinkable happened. 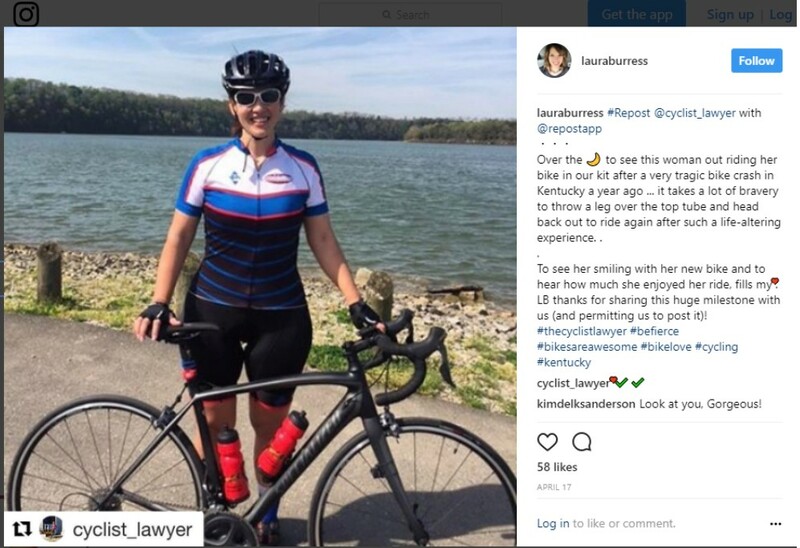 Laura Burress and Rebecca Schmidt were on a 53-mile bike ride in Columbia, KY when they were struck by a motor vehicle. The driver, Ronald Franklin, admitted to the use of illegal narcotics. Both women had to be airlifted by helicopter to the University of Louisville for their injuries. Franklin, who was taking Percocet and using cocaine, was not injured. It was April 17, 2016 when Laura, Rebecca and her husband, Chris Schmidt, were riding their bikes on a beautiful spring day. They had stopped several times along the way to have snacks, rest and take in the beauty around them. The ride was Laura’s longest to date. She bought her first road bike in March 2015 and had been riding just over a year when the accident happened. Rebecca, not new to cycling, started riding road bikes 15 years ago. Both women were wearing helmets, gloves, glasses and had a phone with them. Laura remembers coming back into Columbia and riding around the square. Her last memory is turning onto Fairground Street and starting up a small hill. 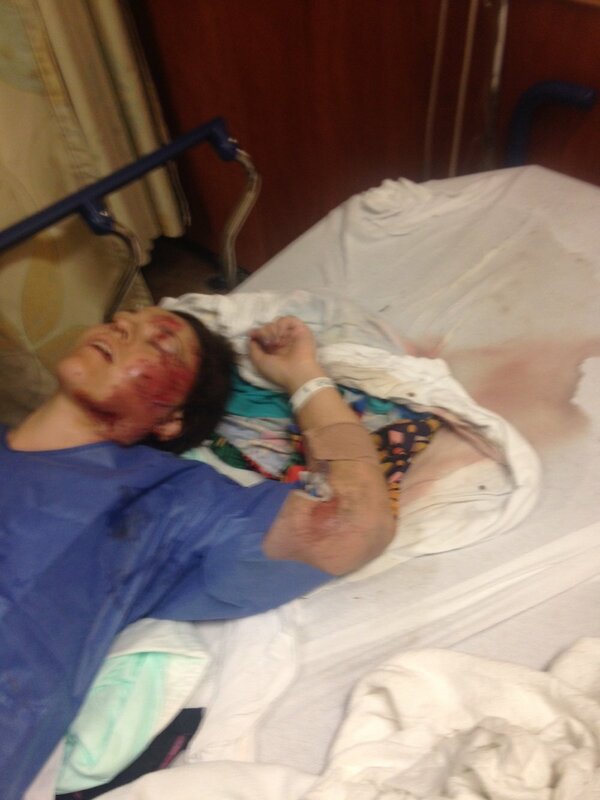 Rebecca, who was riding out front, has no memory of what happened before the accident. They were riding on or close to the fog line, which is the white line painted on the right side of the road and had the right of way. It was around 1:30 p.m. when Franklin, traveling at an estimated speed of 45 – 55 MPH slammed into Laura and then Rebecca. The impact sent Laura and Rebecca ‘flying.’ Laura landed 34 ft from where she was hit while Rebecca landed 24 ft away. Laura’s body took the brunt of the hit. Rebecca’s helmet shattered. At the time of the accident, Chris was up the road about 100 feet waiting for Laura and Rebecca. He did not see the accident happen but he definitely heard it. He knew something was wrong and immediately turned around and headed back. He rode up to Franklin, who he described as slow to react, disoriented and very distant, and knew that he was impaired when he saw his eyes. “He had the look of a person who was under something,” said Chris. “When he looked at me, he didn’t even know what he had done.” Franklin said that he did not see the bicyclists and asked if he had caused the accident. Chris told Franklin to stay there and then asked a football player, who was practicing nearby, not to let Franklin leave. Franklin had gone back to his vehicle and was attempting to change his front right tire, which had been punctured by one of the bicycles. Chris suspects that Franklin was trying to leave the scene. According to the accident report, Franklin claimed that the bikes swerved out in front of him. This was disputed by witnesses. Disregard/failure to yield right of way to a pedestrian or cyclist. He was booked into the Adair County Regional Jail. Adair County EMS treated Laura and Rebecca and then transported them by ambulance to the local hospital, T.J. Health Columbia. Laura’s husband, Wally, was at home at the time of the accident. He had just met Laura, Rebecca and Chris about an hour before to give them some fresh water. After the accident, Chris called Wally and Laura’s neighbor - a colleague of his from work - and asked him to let Wally know about the accident. Wally left for the hospital. He could hear her screaming when he arrived. Around 4:30 that afternoon, Laura and Rebecca were airlifted to University of Louisville Hospital, a level 1 trauma center, due to the serious nature of their injuries. When Rebecca woke up, she had a neck brace on and was disoriented. She wanted to know where Laura was and thought that she had missed her son’s birthday, which they had celebrated three days earlier on April 14th. Rebecca sustained injuries to her head and was diagnosed with a concussion. Both women were badly bruised, sore and swollen. They were treated for skin cuts and abrasions and were in extreme pain. Somewhere between midnight and 1:00 a.m. Monday morning, they were released on pain medication from the hospital in Louisville. Rebecca was told to follow up with her local doctor if her symptoms worsened. Wally, Chris and Rebecca’s son, Cole, had come up from Columbia and were there to drive them home. It was about a 1 3/4 hour ride home. Laura has no memory of leaving the hospital, the ride, arriving at home or the next few days. People came and went. What Laura remembers more than anything is the pain. It took two people to help her get up and go to the bathroom. She needed help to shower and to change clothes. Her back still hurt so badly and she was miserable. The next days were filled with doctors’ appointments for Laura. She saw an orthopedic doctor for her back, an eye doctor due to blurry vision and a neurologist. She had to go to the hospital for additional x-rays because she was so bloated and was not able to have a bowel movement. A trip to the ER was necessary after developing a severe headache and feeling sick after drinking Magnesium-Citrate to help with bowel issues. A CT of her head and abdomen were done and she was discharged with an order for Golytely, which is used to clean out the intestines. Laura’s nurse friends came over on the weekend to help her. They tried everything including home remedies and had her walk around until she could not go anymore because of the pain. Needless to say, she was miserable the entire weekend. On Monday, Laura went to the ER in Bowling Green where more scans were done and Laura was given more medication. She was discharged and thought, “I will go home and die and I did not care anymore. My stomach felt like there was so much pressure inside that something could burst anytime.” The combination of pain and medications started taking a toll on her. By this time, she began thinking that maybe she was crazy and it was all in her head. There were more doctors’ appointments that week. Laura saw a gastroenterologist and followed up with the neurologist on Thursday. She had not eaten anything since Sunday. The neurologist took one look at her and called an ambulance to her office. Laura went back to the University of Louisville ER. It was about a two-hour ride. “It was a bad ride. My back hurt so bad and my stomach had pressure. I was strapped to the board and could not move. I prayed to just make it through the next ten minutes. Then the next ten minutes,” said Laura. It had been 11 days since the accident. That night, Laura had an MRI and neurosurgery was consulted. A neurosurgery resident told her that the MRI was abnormal. He would review the results the next morning with the attending physician. On Friday morning, the neurosurgery team came in and told Laura that surgery on her back was necessary in the next 2-3 days. She had an unstable fracture at L1-L2 with torn ligaments and the disc was protruding into her spinal cord. Laura did not want to have surgery and asked about her options. The attending physician responded, “Your back is not stable. We can put you in a brace but you will be paralyzed in less than three months.” Laura requested a second opinion by a neurosurgeon. He agreed that there was no other option but surgery. The following Monday, Laura underwent a 6-hour back surgery in which two rods and seven screws were placed. She was in severe pain after surgery and although on IV pain medication, it was difficult to keep it controlled. On Tuesday, therapists helped her get out of bed. Moving was painful. She would get light headed and dizzy every time she got out of bed. The pain was always worse at night. “I would cry and cry in pain every night. I hated nighttime,” said Laura. It seemed like the pain was getting worse after surgery. The pain, dizziness and bowel problems continued. The pain medication caused Laura to hallucinate. After two weeks at U of L, Laura was moved to Frazier Rehab. Here she began to get a sense of independence back. She learned how to get out of bed by herself, how to put on socks and shoes and a bowel program was started. It was determined at Frazier that Laura had suffered a mild traumatic brain injury. She had daily cognitive therapy along with physical and occupational therapy. The therapy made her so tired that she would sleep after every session. Laura was sensitive to noise and movement. The first time her therapist took her outside, she wanted to scream. She covered her face and then her ears with her hands. It was too much stimulation. After two weeks at Frazier, Laura went home. Wally was able to get time off from work and stay with Laura from the moment she was readmitted to U of L until she was released from Frazier. “My employer let me take off work as much as I needed,” said Wally. “I often felt helpless, but I stayed as much as I could.” Each room at Frazier had an extra bed for a family member. Wally, a friend or family member stayed with her. She was alone only one night during the entire time. Once Laura came home, Wally did the laundry for months because the washer and dryer were in the basement and he helped out with housework more than usually. Although Rebecca’s injuries did not require surgery, her recovery at home following the accident was difficult and painful. She had bruising up and down her leg and swelling of her arm. The cog from her bicycle left a bruise on her backside. Chris remembers that she did not move very much. She would lie on the couch and sleep a lot. There was not a lot of light in the room and no noise. The TV was never on. Rebecca was very sore and stiff. After about a month, she started therapy. She went through cognitive rehab therapy, physical therapy, saw a neurologist and went to a chiropractor and mental health counselor. She describes herself as tough country girl and a ‘badass’ who has always been able to cope and handle situations on her own, so it is hard turning to others for help. As a result of the brain trauma, she takes daily naps to function, suffers from fatigue, confusion, memory and concentration problems. She is irritable, anxious and sensitive to noise and light. She has been diagnosed with PTSD. She has gained weight, suffers from depression and has noticed changes in her personality. She does not have the energy for activities that used to make her happy. Being involved in her family’s life is important but she can still only spend a limited amount of time with her niece and nephews. Before the accident, Rebecca describes herself as happy, outgoing and fun to be around. She enjoyed socializing. Now, she does not want to be around anyone and is struggling to try to find happy things in life. “She is still not the same. She’s been in a dark place. She’s very reclusive. This accident has taken away her will,” said Chris when asked about how Rebecca had changed since the accident. She used to exercise and enjoyed flipping houses. Rebecca has tried riding a bike again but is fearful. Chris, who is supportive of Rebecca getting back on a bike, took her and Laura to a parking lot to get them riding again. Rebecca explained that within minutes of getting on a bike, she started vomiting and broke down crying. “No medicine fixes that,” she said. Rebecca’s short term memory is severely challenged. She has to write everything down and set reminders on her phone. The cognitive behavior therapist has been helping her to retrain her brain and teach her techniques to cope. Rebecca has missed important family events such as her son’s first college visitation and Chris’ Ironman races. She plans events around taking her medicine so that she can function in a reasonable manner. There are financial concerns that cause her stress. For eight months, they depended solely on Chris’ income. They have a son in college and debts. She has not been able to work a full day since the accident and wonders if she ever will. Rebecca is the Coordinator of Technical Support Services at Lindsey Wilson College. She works Mondays and Tuesdays until 2 or 3 in the afternoon and takes Wednesdays off to recover. She goes back to work Thursdays and Fridays. Chris explained that repetitive tasks naturally come back to her. However, projects out of the norm cause her brain to fatigue. “When she is rested, she is sharp,” said Chris. She keeps the books on their rental properties, communicates with the renters and does taxes. Rebecca worries that her employer is going to fire her for not being able to complete all of her job responsibilities and requirements. Rebecca has not received a full paycheck since the accident because she is unable to work 40 hours a week. Laura, an RN, went back to work six months after the accident. She returned with limited hours and worked her way back to 40 hours per week in one month. In December 2016, the hardware in her back was removed and she was in the hospital for three days. She returned to work two weeks later and took a different position with her company where she could work from home ninety percent of the time. Laura has a standing desk for work and spends much of the day standing. Previously, she had traveled an average of 800 miles a week as a case manager covering Kentucky and Tennessee. She knew it would be difficult as a result of the accident to return to this position. Her employment opportunities in comparison to what they were before the accident are limited. She would have difficulty working as a nurse in many healthcare settings, especially ones that would require lifting and moving patients. Her back hurts every single day and she believes that she will continue to deal with it the rest of her life. She is down from seven medications to two now for nerve pain and anxiety. Prior to the accident, she was not on any medication. Due to the side effects of opioid use, she has refused to take any such pain medications. Laura worried that she would get dependent. She manages her pain by stretching, exercising, ice, anti-inflammatories and a TENS unit. TENS is an acronym for transcutaneous electrical nerve stimulation, which is a therapy that uses low-voltage electrical current for pain relief. Like Rebecca, she struggles with riding a bike again and is anxious the entire time. She really wants to get back to riding because she thoroughly enjoyed it. Wally worries about Laura’s safety. He is scared the same thing will happen again and would like her to ride on trails or places where there are no cars. The accident has put fear in her unlike any experience before and has become a big part of her life. She had several experiences in the hospital from this injury that were unpleasant and potentially could have been life changing. She made her family promise not to leave her alone and to stay with her while she slept. When leaving Frazier, the nurse advised her to wear a large shirt over her back brace so as not to advertise that she was injured. This could potentially lead people to believe that she was on opioid medication, which could result in someone following her home or breaking into her house. This only added to her overwhelming fear. They have not been to the movies because Laura does not feel that she could comfortably sit through a movie. She and Wally missed their annual vacation last year because she had used all her PTO time for her injuries. Wally missed over a month of work between the hospital and medical appointments. She has missed two funerals and her nephew’s wedding due to travel distance. When she travels now, even relatively short distances, she has to stop frequently to give her back a break. Wally has not ridden his motorcycle as much since Laura got hurt. Memory loss and trouble focusing as a result of her traumatic brain injury. On top of all of the medical issues, the Burress and Schmidt families had to deal with legal issues. Chris reached out to our firm just days after the accident. Megan represented Laura and Rebecca in the civil case and she was able to obtain full limits from all applicable insurance policies. While the civil case resolved quite quickly, the criminal case dragged on until September 12, 2017 when Franklin was finally sentenced. There was lots of frustration for the families during the criminal case. The Commonwealth’s Attorney, Gail Williams, who was prosecuting the case, did not communicate important information and dates to the families. They were not given adequate time to plan for traveling or time off from work. The Kentucky Crime Victim Bill of Rights Handbook states that victims shall receive prompt notification, if possible, of judicial proceedings relating to their case. It goes on to say that attorneys for the Commonwealth shall make a reasonable effort to insure that victims and witnesses are notified promptly of any scheduled changes that affect their appearances. Chris said it was embarrassing and frustrating how the case was being handled. Instead of waiting to hear from William’s office, Chris started calling to get updates and information. “It was always like we were in trouble for asking questions,” said Chris. He ended up filing a complaint against Williams. Wally felt like Williams showed no interest in helping the families and was lazy. Megan stepped in and attempted to act as a liaison between the families and William’s office, and as a guide through the criminal matter. When Megan called Williams to obtain information on their behalf and per their request, he hung up on her. Following this phone call, Williams sent Megan a letter stating that he was refusing to discuss the case any further and would not engage in any further conversations with her. While he claims he was "more than happy to discuss the case with the victims," in truth, the victims were given the same treatment- radio silence, condescending tones, and last minute demands that they appear in court with no advance preparation or discussion. Megan continued to remain closely involved with both families until the conclusion of the case. She had no ulterior motive other than to see that the system properly prosecuted Franklin and held him accountable. The victims wanted to ensure justice against the driver who had caused so much harm and needed someone to represent them. Megan reflects, "It was pure teamwork, and while hard and exhausting at times, we all stayed the course until the end. We just kept pushing until we got information and answers. How awful to have these victims treated like this by the appointed official elected to represent them." “Mr. Williams was not serving us. He was serving himself. Megan became our best friend. She’s part of our family. She cared about us as individuals. She made us feel like a family member working on a case for a loved one,” said Chris. Thankfully, Williams retired from his position during the criminal case. Brian Wright, a new, more determined and involved district attorney stepped in and handled the case until resolution. Chris describes him as more thoughtful, attentive to detail and an excellent communicator ... a polar opposite of Williams. Since Franklin pleaded guilty to two counts of assault in the second degree (a felon), failure to yield right of way and driving under the influence (both misdemeanors), there was no jury trial. As part of the plea agreement, Franklin had to agree to have his identity used in a bicycle safety awareness video. The video would also include his statement at final sentencing. Mr. Wright recommended a nine-year prison sentence. At the sentencing, Franklin gave his statement in which he apologized to the victims and asked for forgiveness. What he did not do, was take responsibility for driving under the influence that day. Instead, Franklin stated, “Anybody, anybody that rides bicycles and stuff, I mean people needs to be really careful of them ‘cause they are easy to miss.” Following Franklin’s statement, Mr. Wright faulted Franklin for misconstruing the cause of the accident and emphasized that it is not that bicyclists are hard to see on the roadway; it’s that people should not be driving after using cocaine and taking Percocet because it puts everyone in danger. Chris did not feel like it was a heartfelt, sincere apology. Franklin’s words were empty. Laura and Rebecca were able to address the court during the sentencing hearing. Laura spoke first and read her victim impact statement. “Before the accident, I was active, independent and confident. I ran, swam, biked and worked out at least five days a week. My activity level has changed dramatically because I currently am unable to do the things I once did.” She went on to say, “I have had to learn how to ask for help and accept assistance with things I used to do on my own.” She asked the judge to consider the pain and suffering that she had been through and to remember that the pain was not over. Chris read his wife’s statement. Rebecca was not able to tell her side of the story herself in court that day because the stress, anxiety and emotions connected with the accident would have gotten her too upset to speak. In her statement, she expressed that her life would never be the same because of Franklin but that she was learning ways to adjust. “It’s sad. I have to adjust my life because of you, because you have problems with drinking, drugs and other things. If you don’t think you have a problem, please look at your list of convictions.” She hopes that Franklin never gets to drive again because his recklessness almost took away two lives. In her final question to Franklin, she asked whether he planned on being part of the solution or whether he would continue being part of the problem. The court followed the recommendation of the Commonwealth and sentenced Franklin to nine years. Due to the seriousness of the event, probation was denied. Franklin received credit on his sentence since he had already served one year in jail. He is eligible for parole in February 2018. As the families try to move forward, Chris encourages Rebecca to remain positive. He leaves her thoughtful notes and flowers and even set up a bike on a trainer in the house for her. He reminds her how fortunate they are and kisses and hugs her every day. Laura and Rebecca do talk about the accident. Sometimes they laugh, sometimes they cry. Rebecca bounces questions off of Laura since she is a nurse. Rebecca says they are both pretty positive and glad they made it out alive. Did Franklin receive his just sentence? Rebecca has mixed emotions. “I am a badass but tender hearted too.” He had so many prior convictions that he should not have been on the road. As for Chris, he is pleased that the judge chose the maximum sentence. He also believes in grace in the world and said that if our system says that this is the penalty, then grace should be allowed. He hopes that Franklin changes for the best. What advice do they have for motorists and bicyclists? Motorists need to slow down and share the road. Don’t drive distracted. Pay attention while driving. Bicyclists should do what they can to be safe and follow road rules. Life is too short. There is no reason for motorists and cyclists to hate each other. We can share the road. Choose roads that are less traveled. Laura has a final piece of advice; if it’s something you enjoy, don’t give it up. Don’t let fear keep you from riding, myself included. I want to enjoy riding again!